What a weekend! 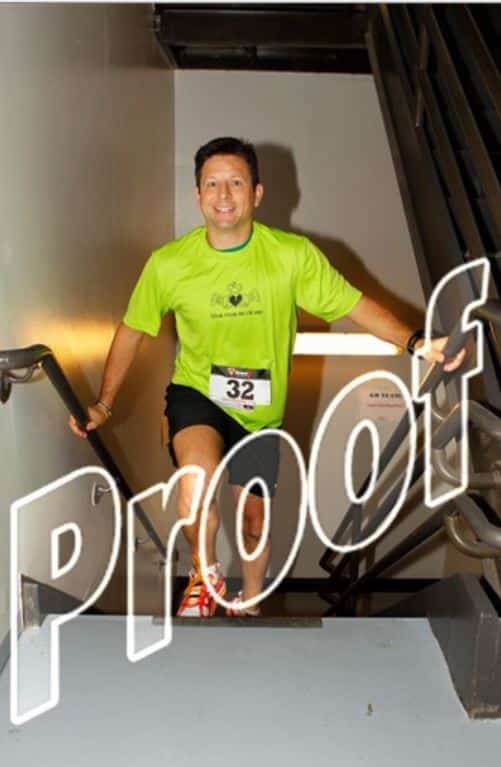 I raced with Team Foley Saturday during the Fight For Air Stair Climb in Tampa at the Bank of America building, then I did my first triathlon of the season at the HITS Ocala Olympic Triathlon. Needless to say come Monday morning I was a little stiff, but full of rigor because of what I accomplished. Saturday morning the alarm went off at 5:30am which actually was about 45 minutes later than during the week. (WOO HOO! I got to sleep in.) 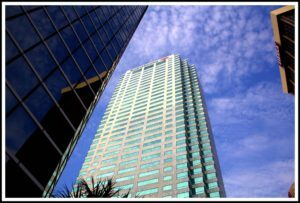 I had no trouble jumping up, taking a quick shower to wake up, and heading into downtown Tampa for the Fight for Air Stair Climb. 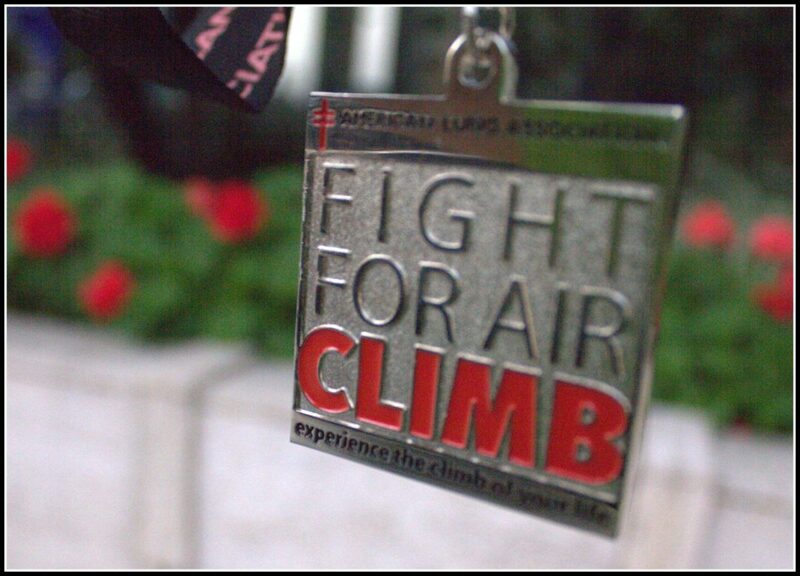 These stair climbs are sponsored by the American Lung Association and are held all over the country. The Tampa event consists of a team event, an individual event and a firefighter event. The Team Event, incorporates an undetermined amount of members on the team, and is scored with the top 3, lowest times. 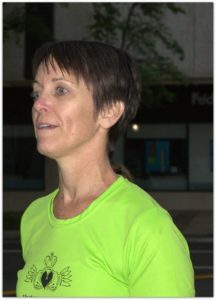 The members of teams, and athletes not members of teams, are entered into the individual event which incorporates the common age groups and is scored based on the individual’s performance. The firefighter event, is strictly for active firefighters sporting their full protective gear. Boots, pants, coat, helmet, tank and mask, while then racing up the 42 flights. It is an incredible site. 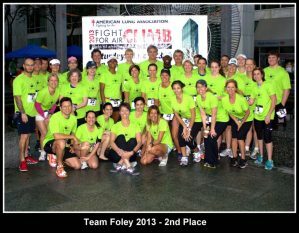 I have been a member of Team Foley under the leadership of Captain Lisa Jamison for the last couple of years. John Foley was a good friend of hers whom passed due to lung cancer, so our team has always dedicated our performance to him. The last two years we finished first and won the team competition, but unfortunately a team named “7 Minutes of Pain” ended up winning, but we finished a close second. The event starts with the normal registration and announcements outside the building and then the teams are brought in by their predetermined time, to the stairwell. The bibs we are given have timing chips built in and a couple of steps before the first set of stairs is a start mat with the finish mat at the top to capture the times. We arranged ourselves from fast to slow, so their would be very little passing that would cause a delay in any team member’s time or interrupted strategy. I was positioned right behind Eric Scola, a CrossFit instructor and friend who was in obvious excellent shape. He took off as I waited required 10 second gap in-between athletes before I started my journey to the top. For such a short race, it feels like forever. There are different strategies to running the stairs. Last year I blasted up 15 flights, before my lungs decided they had enough and I had to slow down. This year I decided to take the same pace all the way up. I found a rhythm of pulling on the rails and double stepping almost the entire way. I did take a few single steps about 4 times during the duration of the race, but I mainly stuck with the double. It ended up working for me with a time of 7:22 which was just about the same as I did last year, but I felt better and recovered faster. 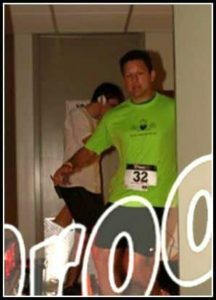 In 2012, my lungs started really burning around floor 30 and it was very difficult to continue and it lasted almost 30 minutes after I completed the climb, but this year I ended up at the top feeling pretty good. That is, until I sat down. The burning sensation caught up with me as I was recovering in a small room at the top with a bottle of water. It was very uncomfortable. Thankfully they did not allow us to stay as long as we did in the past and shooed us back downstairs. With the fresh air, I ended up recovering in about 5 minutes from the moment I exited the building. There is no ventilation in the stairwells or humidity for that matter and I believe after using maximum effort without regards to heart rate or respiration rate, it leads to that burning sensation for me. After recovering an drinking some more water I found myself feeling really good. It is the longest 7 minutes of my year, and I am so happy I have the ability to fund raise and compete in this race for Lisa and Team Foley. Do you want to join us next year? I’ve never done a stair race but this looks fun! I Merely wanna state that this is very beneficial , Thanks for taking your time to write this.